Getting organized at the office feels like a waste of valuable time to some. Why set the stage when you can just start acting? 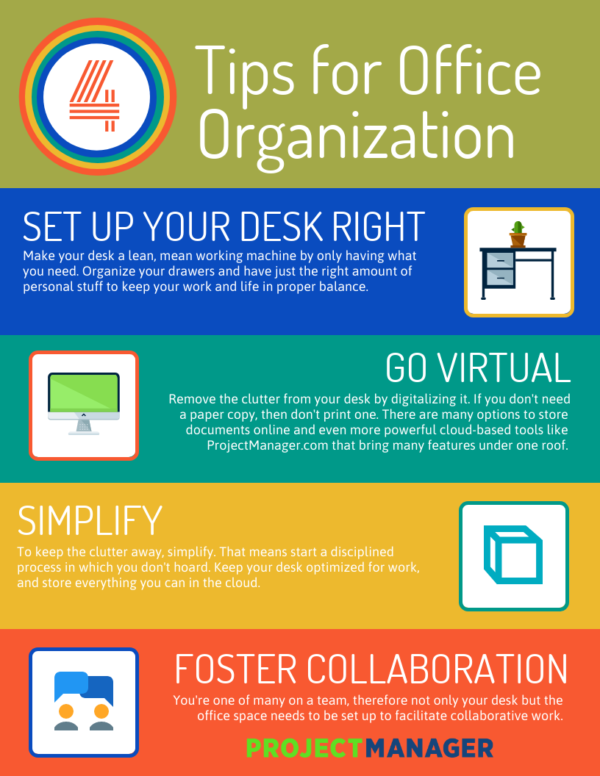 But the truth is, if the stage isn’t set properly with effective office organization techniques and project management tools, you’ll waste even more time navigating the clutter in your work space and your chaotic workflow. Hence, it makes sense to get organized. But don’t take our word on it. Researchers at the Princeton University Neuroscience Institute noted in an article called “Interactions of Top-Down and Bottom-Up Mechanisms in Human Visual Cortex” published in The Journal of Neuroscience that clutter makes it harder to focus (though they didn’t use such simple language). You got to focus on your work, not the clutter, and that clutter can be of a variety of sorts, from old papers to outdated software, all conspiring to sap your productivity. Don’t let it get you; get it first by following these office organization ideas. According to CNN Money, people lose an hour of work daily because their office isn’t organized. The best place to start is with your desk. Where’s your monitor? It should be at eye-level and about 17 inches away from you. Then put those other items you use frequently, such as your phone, on your dominant side. That makes it easier to reach. Yes, your office organization ideas should be get that minute. Details matter. The office supplies you use a lot should also be on your desk, but those that you only need a couple times over the week should be in one of your desk drawers. This keeps you seated and working, not walking around and searching. It’s okay to have some personal items on your desk. It’s part of the work-life balance. But it’s the balance you want to achieve. Therefore, keep the doodads and pictures to a minimum. You want to have a good amount of free space on your desk, at least as big as a sheet of paper, so you have a place on your work station to sign a document or other work that might come to you unexpectedly throughout the day. Your desk isn’t chiseled in stone, so to speak. You’ll want to reassess its functionality regularly to make sure that you’re always working as efficiently as possible. But what about the office clutter that desks attract like magnets? That’s addressed next. If you have young kids, they probably play with Lego, and if you walk around without shoes at home, you’ve probably stepped on a few errant pieces. That is not a pleasant experience. Then, if you’re lucky, the kids grow up and discover that Lego has a virtual building site online, and never again are you frightened to go barefoot (at least in your house). You can take this lesson and turn it into an office organization idea. So-called “clutter-buster” Mia Lotringer offers this advice on the Psychology Today website: “Anything you can keep as a document on your computer, do!” She goes on to suggest that you never print anything out unless you must, and then to always back up that digital data, so if there is a glitch of some sort, your information is safe. It’s easier than ever to keep your work on the cloud, so even if you suffer a catastrophic computer issue, all your work is safe. This is true for documents, such as Google Docs, but also applies to every aspect of your work, including tasks. Cloud-based project management software store your files and project plans on the web, where you can not only rest assured that your data is protected and safe but access it anywhere and at any time. Getting rid of clutter is only a beginning. It’d be nice if you could clean up your desk so it never gets messy again, but that’s sadly not how things work. Work is a dynamo of paper and activity, and there is no safe haven to avoid the whirlwind of clutter unless you land on the unemployment line. That, of course, is not an option. How do you keep the clutter at bay? According to Forbes, simplify! Okay. That sounds nice, but how can you simplify when your work is increasingly demanding and complex? First, you must learn to discipline yourself. That’s a process, of course, so don’t expect things to change overnight. But in time, if you keep at it, the clutter will decrease. Some suggestions would be to don’t get more than you really need. You probably don’t need all those screens staring at you all day. Many of these devices can be folded into one tool that does it all and keeps you focused and productive. Now that your personal space is optimized for working more effectively, which is the micro, what about the macro? That’s the whole office space. You might not have the authority to order a full-on Feng Shui redesign, but chances are you’re not working on an island and will have daily interactions with other team members. How can you facilitate this larger structure to meet the office organizational goals you seek for greater overall productivity at work? Wired has an article on optimizing your work space, and high on their list is quantifying what makes the team happy. Yes, a happy worker is a more productive worker, according to research cited in Fast Company. The furniture maker Herman Miller also conducted a study on how the set up on an office space helps or hinders creativity and productivity, mentioned in the Wired piece. This was no brainstorming meeting, but a science-based study that went as far as to hire phlebotomists to get blood samples and monitoring subjects’ physiology! What did they find? That by creating an atmosphere that supported social interaction, team members were more content and therefore happier on the job. Happy workers, productive workers, remember? Whether that means creating an open-office plan or a specific grouping of team members, having spaces where they can easily interact is important. Whatever you choose, you want to foster an office space that is user-friendly and facilitates, not prevents, people from mixing. If you’re looking to go virtual and get collaborative with your team, then ProjectManager.com is the organizational tool you’re craving for. It’s a cloud-based project management software, meaning everything is saved to the web. A real-time dashboard gives you up-to-date info and online Gantt charts makes scheduling easy and collaborative. See how it can finally get you organized by trying it out for 30-days with this free trial.